I was starting to feel like my quest to try 50 unwritten-about restaurants was turning into Mike’s list of mediocre bummers. A lot of places that just didn’t measure up to what small promise they offered from the outside. (Especially since I was sitting on the whole stash of mostly good Bridgeview middle-eastern places till the piece appeared in Time Out.) Which is the reality of doing this, of course; you try a lot of places and if you’re lucky, once every three or four times they’re good enough to want to go back, once every 50 or 100 times you find a true gem. 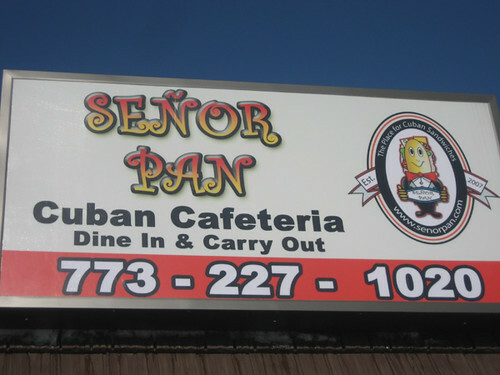 !Muy sabroso, Senor Pan! Much of it seemed to be on a similar level of not-as-slick-as-it-thinks corporate inauthenticity— or at least suggested that someone involved had had a past career in fast food. The menu was in the same font as Chipotle’s; a large banner inside offered a dollar menu. It felt very much like the imitation-American chains you see in Europe, half Mickey D, half Cafe des Poseurs. It was shockingly… pretty good. 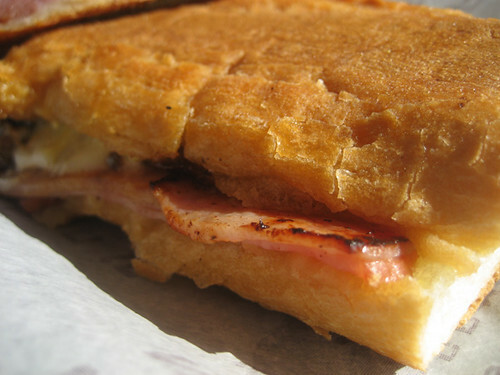 Quality ham and cheese, house-roasted pork with some crispy crackling flavor around the edges, same Gonnella (I suspect) bread as all the other Cuban places in town, which isn’t Miami-authentic but is what we settle for here. 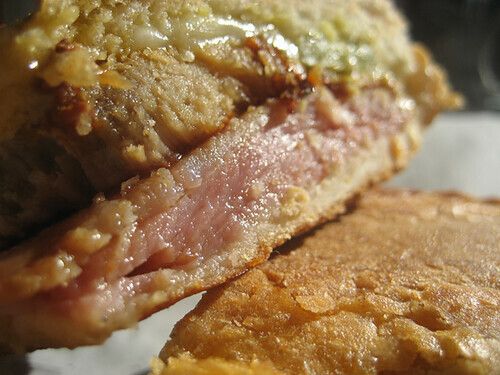 A side of plantains was just fine, too. So, you never know. Judge a place by its sign, you gotta, but accept that sometimes, a better place may lie inside.